And like the zillions 'O stories languishing away here in the fields of Nofendersville... This teeny-weeny story has mushroomed outta perportion, like many stories I begin scribblin'. As arguably noted in Part 1, Messer Surtees is the most famous of the two-wheel warriors to cross over into the realm of four wheels, specifically single seaters, the only person to have won a world championship in both disciplines ever! Yet there's some other hugely successful knee draggers who've also been somewhat successful in the world 'O Carz. John Surtees, Mike Hailwood, The Rodriguez Brothers, Jean-Pierre Beltoise, Francois Cevert, Johnny Cecatto, Damon Hill, Mark Blundell and Mark Webber. Joe Lenard, Danny Ongais, Swede Savage, Eddie Lawson and Jeff Ward. Originally, I only knew of Joe Leonard's name due to being one of the three Granatelli drivers of those iconic Lotus 56's, with Leonard having won the Pole for the Indy 500 in 1968 and barely losing the race due to a mechanical failure while leading on lap-191 when his fuel shaft broke. Yet Joe was unquestionably a 'BAD ARSE on Scooters, where he began his racing career, winning the inaugural AMA Grand National title in 1954, then winning it twice more, (1956-57) along with runner-up finishes in 1958, 1960-61, third place in '55 and a lowly fifth place in '59! As Leonard also won the prestigious Daytona 200 twice between 1957-58 before turning his attention to four wheels after the completion of the '61 season. Everyone probably knows the name Swede Savage due to his infamous wreck at the Speedway in 1973, where multiple factors contributed to his gruesome looking accident which sent a fireball into the air some sixty-feet high! As sadly, the San Bernadino, CA native would die from complications 33-days after the accident. Yet Swede, like many began his career by racing motorcycles, having even been denied eligibility for High School football from accepting prize money while racing! Reportedly his cool sounding name and ability to "Wheelie' his motorcycle for a mile at a Ford test at Riverside got him the push from marketing executives and he began his career running Stock Cars, then Sports Cars and extensive time in the Trans Am series alongside AAR team owner Dan Gurney before winning his lone IndyCar race at the Bobby Ball 100 at Phoenix Int'l Raceway in 1970. Lawson made his name by winning multiple AMA titles and then spring boarding a la rival "Fast Freddy" Spenser, who'd moved up to international 500cc GP competition the year prior to Lawson's debut as "the King's" (Kenny Roberts) team-mate during 'KR's final season; as the rest as they say is history! 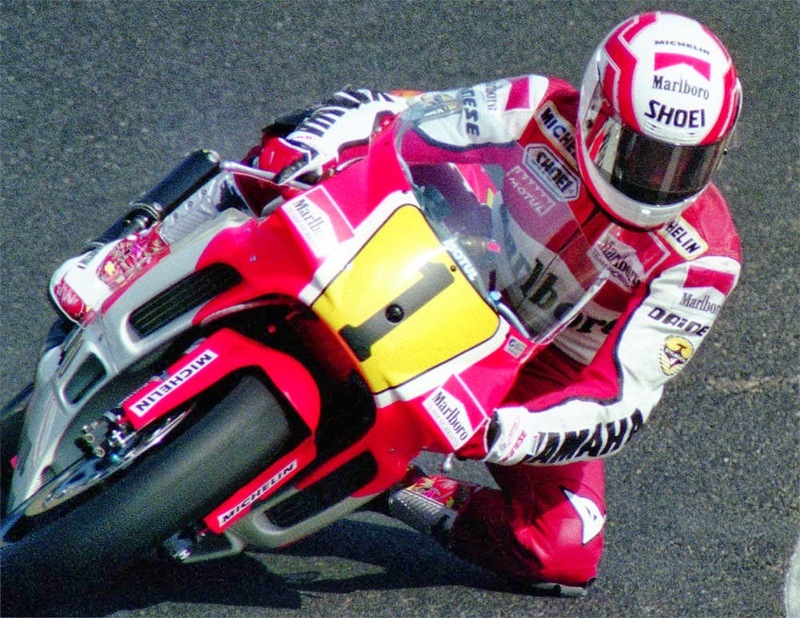 After having given Italian manufacturer Cagiva its debutant 500cc GP victory, notching the Californian rider his 31st GP win, the third most overall at the time, Eddie walked away from Scooters' at the end of 1992, albeit riding twice more post-retirement in the following two years Daytona 200 - which he won for a second time in 1993 and finished third in '94 before focusing solely upon racing cars. Had NO idea that Jeff Ward was actually from Glasgow, Scotland and nicknamed "the Flying Freckle." As Ward moved to California at the age of four and immediately immersed himself in the SoCal' environment, including minibikes. Ward took like a duck to Water en route to becoming one of the best of all time Motocross riders, becoming the first to win championships in all three categories, and added a Supercross title to his burgeoning list, which includes seven Motocross des Nations victories. Ward walked away from two wheels at the end of 1992 in order to pursue a four wheel career which saw him finish third in the controversial 1997 Indy 500 behind Arie Luyendyk and Scott "what Pacecar?" Goodyear en route to winning Rookie Of the Year honours. Ward's best season followed a year later when he finished sixth overall in the '98 Indy Racing League standings, along with winning the 2002 Texas IRL race by just inches ahead of Al Unser Jr. in the No. 9 Target chip Ganassi Racing machine - which we all know now is Scott Dixon's number.